Girl: Did you have a good day at school, Joel? Boy: Yes. We talked about different jobs. Alice would like to read the news on TV! Girl: That’s an amazing job! What about Milton? Girl: And work in a hotel? Boy: No, in his own restaurant, he said. Girl: Wow! And Saskia? She is good at sport, isn’t she? Boy: Yes, but she’d like to look after a park and work outside with nature. Girl: That’s interesting. What about you? Boy: I don’t know. Ellis would like to work with animals. I’d quite like to do that. Boy: That’s right. And Lydia says she wants to teach. Girl: Young children or older children? Girl: That’s a difficult job, I think. Girl: Yes, but I think you have to be very brave to do dangerous work like that. question, choose the right answer (A, B or C). You will hear the conversation twice. Boy: There’s a brilliant drawing and writing competition in this magazine, Anna. Girl: What do you have to draw, Greg? Boy: A monster… something strange that lives on the moon or something. Girl: Do you have to write about the monster too? Boy: Yes. The monster’s age isn’t important, but you have to choose a name for it. Girl: And should it be big? Boy: But you do have to say what special things it can do. Girl: OK. How many words can you write? Boy: You have to write more than 50 but less than 150. Girl : Aren’t you too old to draw monsters, Greg? You are fourteen! Boy: I know! But the competition’s for 13- to 15-year-olds. Girl: OK. Who’ll choose the winner? A cartoon artist? Boy: No, a writer… and there’ll be a photograph of the winner in the magazine. Girl: Wow! What’s the first prize? Not cinema tickets again. Boy: It’s much better than that – 50 pounds to spend in Super Store. Girl: Oh, that’s useful. I need pencils, pens and a new school bag. Perhaps I’ll enter the competition too! A.One day, grandmother told him her secret way of making jam. Robbie made too much for the family to eat so he took it to other people in his street. He made moreand more jam. It tasted so good that his parents’ friends started buying it from him. Robbie added all his costs together then decided on a price. being at school. In English, he had lots of problems. C.Then he made a business plan on the computer with help from his dad. Now people can buy his jam at a weekly market. It tastes wonderful and it’s healthy because Robbie uses grape juice, not sugar, to make it. F) to its beginning. There is one extra ending you do not need to use. A. the secret way to make jam. D. he couldn’t spell very well. F. in his own home. For questions 21 – 27 read the text My trip to Canada by Tessa Watts and decide whether the information in the sentences is right (A) or wrong (B). Write the correct letter (A or B) in your answer sheet. I had a great time on my adventure trip to Canada. I went with two teachers and all my classmates. I missed my family at first but by the end of the holiday, I didn’t want to go home! On my favourite day, we went on a long walk in the mountains. We had to carry all our things in bags on our backs, which was hard work, but we never got bored because we all chatted the whole time. We had a rock climbing lesson just before our picnic lunch and later that afternoon we arrived at a lake where we camped for the night. Three of my classmates tried to fish, without success! I helped build the fire. The teachers and two of the older students made supper, then we sat in our blankets around the fire and sang songs and made wishes in the dark. We decided not to sleep inside the tents, but outdoors because we wanted to look at the stars. Some of the boys made “bear” noises trying to make us afraid, but we were still laughing at midnight because we were having so much fun. I’ll never forget that day. 21. Tessa felt happy on the first day because she was with her family. 22. Tessa talked a lot with other people on the walk. 23. After the picnic lunch, the group had a lesson in rock climbing. 24. The students caught three fish in the lake. 25. The older students helped the teachers make supper. 26. The students didn’t sing songs because they left the guitar at home. 27.The group slept outside so they could look up at the sky. 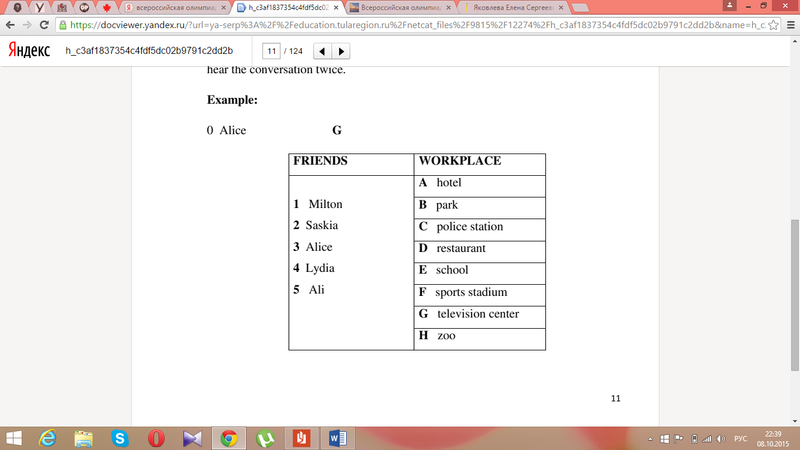 For questions 28 – 37 read the text below and decide which word (A or B) fits the space best. There is an example (0) done for you.